With Easter approaching, I’m going to take a break from blogging about the characters in Napoleon in America, and instead look at how Napoleon spent Easter in Corsica in 1792. That Sunday, a quarrel between children erupted into a gunfight that pitted Napoleon and his battalion against the residents of Napoleon’s hometown of Ajaccio. In an act of treason, Napoleon took advantage of the disturbance to attempt to neutralize his adversaries and capture the Ajaccio citadel from the French garrison. In April 1792, Napoleon Bonaparte was a 22-year-old first lieutenant on leave from his French artillery regiment. Technically, he was AWOL, as he had neglected to request an extension of his leave, which expired the preceding December. It was the fourth in a series of extended leaves Napoleon had spent on Corsica since 1786, helping his widowed mother Letizia deal with family affairs, and working with his brother Joseph to advance the Bonaparte family in island politics. Though Louis XVI was still king, the French Revolution was in progress and the royal family was under house arrest. Corsica – which was under French rule – was divided among those who favoured the revolutionaries, those who favoured the royalists, and those who favoured independence. The president of the department of Corsica was Pasquale Paoli, a former independence fighter who had been supported by the Bonapartes, though Napoleon and his brothers were increasingly identified with the revolutionary party. Paoli’s supporters were split between those who wanted independence and those who supported revolutionary France. Though the royalists were no longer politically in charge of Corsica, they still, through the army, had support in key strongholds, including Ajaccio. 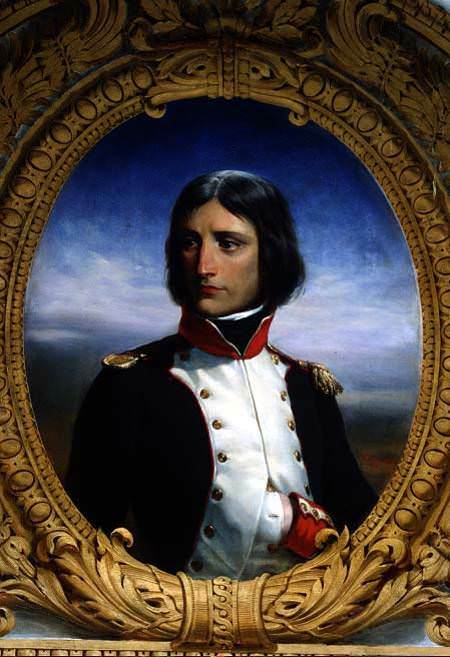 To avoid having to rejoin his regiment, Napoleon used bribery and intimidation to get himself elected, on March 31, as a lieutenant colonel of the 2nd Battalion of Corsican Volunteers (the Corsican National Guard). He was posted in Ajaccio, where the population was largely pro-church and royalist, and thus hostile to the National Guard, which was pro-revolution. On Easter Sunday, April 8, 1792, a group of priests who had refused to swear an oath of loyalty to the French republic held a service at an officially dissolved convent in Ajaccio. They announced that a religious procession – in practice, a political demonstration – would be held the next day. Around 5 p.m. that afternoon, in the rue de la Cathédrale of Ajaccio, some girls playing sbriglie (a version of the bowling game ninepins) began to quarrel. Two sailors, cousins of the girls, got involved in the argument. One called the other “porco” (pig) and “coglione” (idiot). (1) The insulted party draw his dagger. Witnesses stripped him of his weapon, but he soon reappeared with a pistol. Hearing the noise, a dozen National Guard volunteers arrived on the scene. They arrested one of the men and attempted to search a passing mason, who protested against the search, seizing the gun of the soldier who threatened him. The mason’s brother came running with a pistol and fired on the Guardsmen. The Guardsmen returned fire, grievously wounding one of the men. The locals fired back from neighbouring windows, and the Guardsmen retreated to their quarters. The local council decided to investigate the situation and punish the guilty, but was not until 10 p.m. that the judge went to the cathedral. Napoleon accused the municipal officials of inaction. Napoleon and the other lieutenant colonel in command of the battalion declared that since the town was in insurrection, the National Guard had the right to protect itself by firing on the Ajacciens. The next day (Monday, April 9), after occupying strategic positions, they started laying siege to the town. Around 7 a.m. they fired on people leaving the cathedral after mass, killing a widow and a 13-year-old girl. Several others were hit, including an abbot who was wounded so badly that he died the following day. Napoleon’s battalion and the townspeople remained at a standoff for the next several days, as hundreds more National Guardsmen arrived as reinforcements. Negotiators went back and forth, ceasefires were arranged and broken, and shots were fired, though nobody else was killed or wounded. Arguing that his men were in mortal danger, Napoleon tried to convince the commanding officer of the 42nd Infantry Regiment, which held the town citadel, to permit the Guardsmen access to the citadel, or at least access to the ammunition there. When the French commandant refused, there was talk of kidnapping him. Napoleon also tried unsuccessfully to convince the troops in the citadel to defect. The National Guard prevented anyone from entering or leaving Ajaccio. They killed cattle, ravaged orchards and blocked access to the town fountains. Bread and wood started to run short. The Directory of the department sent two commissioners to sort out the mess. They entered Ajaccio on Monday, April 16, and prohibited everyone from carrying arms. They sent the National Guard battalions back to their villages, ordered Napoleon and his fellow commanding officer to Corte to meet with Paoli, and had 34 of the townspeople imprisoned. Napoleon wrote up his version of events. He accused the population of Ajaccio, “made up of cannibals,” of having mistreated, insulted and assassinated the National Guard volunteers. He assured the Directory that his men were forced to defend themselves against a premeditated plot, and that, on April 9 it was the Ajacciens who opened fire. He did not say anything about the dead and wounded caused by his battalion. Though the affair showed Napoleon to be energetic and resourceful, it also revealed less appealing traits. As Philip Dwyer notes in his excellent biography of Napoleon, the young lieutenant colonel incited regular French troops to revolt, used local authorities in his cause, opened fire on a civilian population and laid siege to his home town. All of the documents from the commissioners, the Directory of the department, and the town condemned Napoleon and his battalion. Napoleon had to go to Paris to defend himself. On July 8, 1792, the Minister of War wrote that, having carefully examined the dossier, he found that Napoleon and his fellow lieutenant colonel had promoted the unrest and the excesses of the troops they commanded. Both were “infinitely reprehensible,” and if their crimes had been military they would have been court-martialed. (6) However, since both civilian and military personnel were involved, the case had to be referred to the Ministry of Justice. That Ministry, occupied with more pressing matters, did not follow up. As the government was short of trained officers, the affair was forgotten. On July 10 – two days after being blamed for the disturbance – Napoleon was informed that he would be reinstated in the 4th Artillery Regiment with promotion to the rank of captain. Arthur Chuquet, La Jeunesse de Napoléon, Vol. II: La Révolution (Paris, 1898), p. 268. Philip Dwyer, Napoleon: The Path to Power (New Haven & London, 1997), pp. 90-91. Extremely interesting. A reviewer of the latest biography, by Andrew Roberts, out last year, called him a ghastly little man, and one can see why. Talented, though, and capable of inspiring devotion, like the Fuehrer. Thanks, Geoffrey. Glad you enjoyed the post.